The rich burial No. 7 was found within tumulus No. 1, called “Goljamata mogila”, which itself is part of a necropolis consisting of at least three other tumuli. The necropolis is situated 1.5 km southwest from the Ovchartsi village, on a hill on the left bank of the Goljamata reka, a tributary of the Ovtscharitsa River, which flows into the Sazlijka and farther down into the Maritsa River. Whereas barrow No. 2 was destroyed as a result of mining work, barrow Nr. 3 was excavated just in time to escape a similar fate (Панайотов / Александров 2005, 79–80). The preserved height of the Goljamata mogila (Fig. 2) amounted to 5.50 m at the beginning of the excavation, with a diameter of 40 m. The rescue excavations were carried out in two seasons. 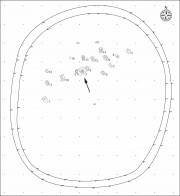 In 1986 H. Bujukliev and P. Kalchev examined the larger part of the tumulus and thereby discovered 55 burials, dated to 11th and 12th centuries AD, two Early Iron Age structures with several pits, charcoals and ash, as well as one burial from the Early Bronze Age (Калчев 1994, Kalčev 2002, 54-55, Fig. 24). The continuation of mining and the destruction of the tumulus, respectively, forced I. Panayotov and S. Alexandrov to reopen the excavations in 2002, in the course of which a 10 m wide strip that still stood on the northern periphery of the tumulus was studied. 1 This time 17 burials from the Early Bronze Age and one burial from the 2nd millennium BC were found. The pit of burial No. 7, with a preserved depth of 1.10 m, first cut 15 cm into an Early Bronze Age deposit and continued 95 cm farther into the virgin soil under the tumulus (Fig. 3, especially the profile in the left part of the plan; Fig. 4). We can assume that the original height of the Early Bronze Age tumulus was at least 1m at the time of installing burial No 7, which means that also the pit of the burial must have originally been 80–90 cm deeper. The pit of burial No. 7 in turn severely disturbed an Early Bronze Age burial (Nr. 3), some bones of which came into the fill of burial No 7 (Fig. 2; 3). The form of the pit of burial 7 was regularly oval, the bottom levelled and flat (Александров 2007). The skeletal remains of the deceased were situated in the centre of the pit (Fig. 3). The skull lay on its left side, with the mandible lying 52 cm southwest of it. The vertebrae were in a curved constellation, and the ribs were found strayed to the left and right of the vertebrae. The basin and the legs were found in anatomical order. The bones of the right hand were at a distance of some 20 cm from the skull. The hand was bent into the elbow, and the shoulder and the left hand were found at the same distance (some 20 cm) to the right of the left hand. The left elbow and the hand are missing. The anthropological study of the bone material carried out by a team directed by Dr. Yordanov demonstrated that the buried was a female aged 65+, of robust build and a height of 1.75 m. The skeleton was covered by loose sediment, whereas the rest of the fill of the grave pit consisted of firm soil from the virgin layers. Wood remains were detected upon the bones. Sherds from handmade pots, charcoal and fragments of human bones, probably originating from the destroyed grave No. 3, were noted in the fill of the grave No. 7. 4. Two single, four double, five triple golden spirals and a golden spiral pendant (Lockenring) – all found close to the skull and the spine (Fig. 8, 9, 10, 11). In the following only the golden ornaments will be presented. According to the typology of the gold pendants suggested by E. Zaharia, this golden spiral pendant with half a coil to the back belongs to Zaharia’s type “A” – acircular pendant, variant 4 – with a bend to the back (Zaharia 1959, 107). The closest parallel comes from the nearby tell Galabovo, located on the left bank of the Sazlijka River, some 11 km southeast of Tumulus 3 at Ovchartsi (Панайотов et al. 1991, 140). A golden pendant, almost identical to the one from Ovchartsi, was found in the second building horizon in the Galabovo tell (Leshtakov 1996, fig. 11:4). It is round, made of gold wire with a round section and a diameter of 0.1 cm, bent in a 1.5 coils, while one of the ends is bent to the back in a 0.5 coil. However, its weight – 2.81 grams – is considerably less than the weight of the pendant from Ovchartsi. The pendant from Galabovo was found in a pit, at a depth of 0.05 m under the floor of a house in the central part of the tell. The fill of the pits consisted of grey-black sediment and burnt animal bones (Leshtakov 2002, 179). The Galabovo tell comprises several Bronze Age building horizons, and its dating is partly based on two samples for 14C dates collected from a house in square N6 and from an oven in square O6, both from the deepest (oldest), 4th building horizon of the tell (Leštakov 1993, 219). After calibration the dates 3890+/-80 BP and 3745+/-50 BP fall into the period of 2470–2270 BC and 2270–2260 BC or 2240–2200 BC or 2200–2030 BC (Görsdorf / Bojadžiev 1996, 163). These values, together with the parallels of the imported wheel-made pottery, allow a dating of the upper three horizons of the tell to the time span of 20th–18th centuries BC (Leshtakov et al. 2001, 23), which in turn can also be applied to our parallel. Another pendant similar to the one from Ovchartsi was found in tumulus No. 3 in Dabene, Karlovo district (Central Bulgaria), and had twice as smaller diameter and thickness of the wire. The complex, within which the Dabene pendant was found is dated to the very beginning of the Early Bronze Age 3 according to the Bulgarian periodisation (Христов 2005, 129; see also Hristov’s contribution on this site.). A similar pendant was likewise found in a burial in the vicinity of the eponym site of Verbicioara (southern Romania). There, next to a skeleton in a slightly contracted position, a pin of a “Cypriot” type and a bronze pendant of Zaharia’s type A, variant 4 were discovered. The diameter is 1.7 cm (Berciu 1961, 145, fig. 15, 16:1, 2). The grave was dated to phase I of the Verbicioara culture (Morintz 1978, 26). In Monteoru, similar pendants made of bronze occur in the phase Monteoru II (Zaharia 1959, 107, fig. 1:6). A northern parallel is known from Zaránk, Hungary. In a vessel, discovered while ploughing, a bronze necklace (torques) and a golden spiral pendant with a diameter of ca. 1.2 cm with a bent end (Kalicz 1968, 120, pl. 88:2) was found. According to Kalicz (1968, 164; 1984, 200 Pl. LVII:24) the find belongs to the Hatvan culture. A golden spiral-like pendant comes also from the grave No. 40 from the necropolis in Szöreg, Hungary (Bóna 1975, 101, Pl. 121:3), also from grave No. 17 from the graveyard Oroszvár and grave No. 1 from Szakony from the Gata-Wieselburg culture (Bóna 1975, 244, fig. 280:14; Neugebauer 1994, Fig. 24:6, 8). Bronze pendants, similar to that from Ovchartsi, also belong to the early phase of Füzesabony culture (Kovács 1984, 241, Pl. LXIX:10). Other parallels, which should be mentioned, were discovered in two burials in Łęki Male, northern Poland. Whereas a pendant with a diameter of 1.3 cm and a weight of 9 g was found in the central grave of a tumulus (grave A), three further pendants came to light in the secondary grave D (Kowiańska-Piaszykowa / Kurnatowski 1953, 58, 62, fig. 12:7; 27:7–9; Pl. IV:4; VIII:3–5). The burials have been dated into the Aunjetitz/Unětice culture (Gimbutas 1965, 260–267) and have yielded two 14C dates (3900+/-150 bp и 3605+/-35 bp), which after calibration give the time span of 2032–1892 BC (Gerloff 1993, 96). Pendants with similar form are known also from a rich tumulus grave in Leubingen, Germany (Müller-Karpe 1980, Taf. 303 A:4, 6), which has been dated to Br A2a (David 2002, 910). Bronze pendants of the wire with a similar form, but a different section are known from graves 81, 39 and 95 of the LBA necropolis of Cîrna in Romania (Dumitrescu 1961, Pl. CLXIII, 1–4). A similar pendant and a conical application also made of bronze are known from Urn 1 in grave 16 in the necropolis at Gruia, Oltenia, which belongs to the Culture with Incrusted Pottery (Crăciunescu 1998, 117, Pl. XV:2,3). Similar pendants are also known in the region of Čačak in western Serbia. A pendant of similar form has been found in urn 1, tumulus 3 in the necropolis of Krstac-Ivkovo brdo, dated to Br2-C (Nikitović 2003, 12–14, 20, Pl. IV:4). A similar bronze pendant was discovered on a platform with traces of fire in tumulus 3 in the necropolis of Janjići as well. It has the same date as the last one discussed (Никитовиħ / Васиħ 2002, 24–28, 31, Pl. ІІІ:5). The horizon of these tumulus graves, designated Mojsinie I, is contemporaneous with the Zuto brdo, Girla Mare-Cîrna culture (Никитовиħ et al. 2002, 58). Single spirals are common in the Late Bronze Age and Early Iron Age of Central and Southeastern Europe. However, in the most cases, the bronze spirals have a different form and dimensions than the Ovchartsi find. For this reason in this case only the exact parallels, which contribute to the dating of the grave, will be mentioned. In the primary grave at Helmsdorf in Saxony a gold spiral was found together with two other golden pendants, two golden pins, a golden bracelet, bronze and stone artefacts and a ceramic vessel. Three 14C dates 3613+/-160 BP, 3645+/-60 BP, 3605+/-30 BP, which after calibration give the time span between 2269 and 1750 BC (Gerloff 1993, 96–97), support a dating in the refined Reinecke phase Br A2a (David 2002, 910, fig. 278:1–10). Parallels are also known from the Aegean. 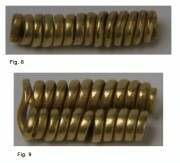 Similar gold spirals from Kition on Cyprus have been dated to the LC II or LH IIIA and IIIB on the base of pottery finds (Karageorghis, 1960, 512, fig. 38). A double golden spiral is known from the already mentioned grave from Leubingen (Müller-Karpe 1980, fig. 303 A:3), dated in Br A2a (David 2002, 910), also from Blučina, Moravia (Müller-Karpe 1980, fig. 403 В:11), contemporaneous with LH IIIA and the beginning of LH IIIB (Furmánek et al. 1991, 20). 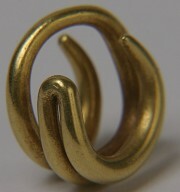 Two double spirals, made of bronze wire were likewise found in grave 58 (cremation) in the necropolis Kisapostag-Dunaújváros. The differences between the pieces from Ovcharovo and Kisapostag consist in the bend of the end and the break in the middle of the spirals from Kisapostag. The grave is dated to the second group of graves in the necropolis, which show parallels with the late phase of the Nagyrév culture (Pásztor 1997, 39, 45–48; Tab. XI; XII). Triple spirals are known from Blučina, Moravia (Müller-Karpe 1980, fig. 403 В:11) and belong to the aforementioned Beladice group; they must be dated to the end of LH IIIA and the beginning of LH IIIB (Furmánek et al. 1991, 20). Three similar three single spirals, welded together and part of a necklace, are known from Cyprus (Gjerstad et al, 1934, I, pl. CXLVII:8) and dated on the basis of Mycenaean pottery into LH IIIA1/IIIB1–2 (L. Åström 1972, 505, 576; P. Åström 1972, 760). Triple golden pendants of similar form, but made of metal sheet are reported from the necropolis Tiszafüred-Mészárosmalom. They belong to the Füzesabony culture (Kovács 1982, 321–322, fig. 1). According to the parallels drawn, a dating of the burial from Ovchartsi in the first half of the second millennium can be assumed. Finally some remarks should be made concerning the manner in which the golden ornaments were worn. Previous studies indicated that the spirals of the type found in the burial No. 4 in Ovcharts, were worn on the torso and the chest. However, the golden ornaments of Ovchartsi were found under the head and the skeleton, which shows that they were most likely fastened in the hair. Probably the single spirals were on top, followed by double and triple spirals, while the whole hairstyle was completed by a pendant with one and one-half coils. Such a hairstyle “fixed with gold and silver” was worn, for example, by the Trojan hero Euphorbos, who was slain by Menelaos in the 17th song of the Iliad. πλοχμοί θ’, οί χρυσω τε και άργύρω έσφηκωντο…„ (Homer, Iliad 17: 51–52). A general assessment of the grave from Ovchartsi shows that it is not typical of the burial rites of the Bronze Age in Bulgaria. The amount of labour invested in the accumulation of the tumulus, the golden ornaments, the bronze parts of a belt, the wheel-made ceramic vessel with painted decoration of likely Aegean origin all show the high status of the buried woman. In the burial of Ovchartsi Central European and Aegean features meet, which show the place of Upper Thrace as a contact area. However, a better understanding of the grave from Ovchartsi requires further excavations and especially a full evaluation of the closest known settlement – the tell of Galabovo. Александров, C. 2007. “Златни накити от могилен гроб от ІІ хил. пр.Хр. до с. Овчарци, о-на Раднево”. Сборник в чест на ст.н.с. Христо Буюклиев, Известия на Иcторическия Музей Стара Загора 3, 2:74-84. Åström, L. 1972. The Late Cypriote Bronze Age. Other arts and crafts. In The Swedish Cyprus Expedition Vol. IV/1D. Lund. Åström, P. 1972. Relative and Absolute Chronology. Foreign Relations and Historical Conclusions.In The Swedish Cyprus Expedition Vol. IV/1D. Lund. Berciu, D. 1961. “Die Verbicioara-Kultur.” Dacia N.S. 5:125–161. Bóna, I. 1975. Die mittlere Bronzezeit Ungarns und ihre südöstlichen Beziehungen. Budapest. Crăciunescu, G. 1998. “L’âge du bronze moyen et final au nord du Danube, a l’est de Portes de Fer.” In Die Kulturen der Bronzezeit in dem Gebiet des Eisernen Tores, edited by C. Schuster, 115–138. Bucharest. David, W. 2002. Studien zu Ornamentik und Datierung der bronzezeitlichen Depotfundgruppe Hajdúsámson-Apa-Ighiel-Zajta. Bibliotheca Musei Apulensis XVIII. Alba Iulia. Dumitrescu, Vl. 1961. Necropola de insineraţie din epoca bronzului de la Cîrna. Bucureşti. Furmánek V., L. Veliačik, and J. Vladár 1991. Slovensko v dobe bronzovej. Bratislava. Gerloff, S. 1993. “Zu Fragen mittelmeerländischer Kontakte und absoluter Chronologie der Frühbronzezeit in Mittel- und Westeuropa.” Prähistorische Zeitschrift 68-1:58–102. Gjerstad, E., J. Lindros, E. Sjoqvist, and A. Westholm 1934. Finds and results of the excavations in Cyprus 1927–1931. The Swedish Cyprus Expedition. Vol.1 Plates. Stockholm. Gimbutas, M. 1965. Bronze Age Cultures in Central and Eastern Europe. Mouton. Görsdorf, J., and J. Bojadžiev 1996. “Zur absoluten Chronologie der bulgarischen Urgeschichte. Berliner C14-Datierungen von bulgarischen archäologischen Fundplätzen.” Eurasia Antiqua 2:105–174. Hood, S. 1982. Prehistoric Emporio and Ayio Gala. Excavations in Chios 1938–1955, Volume II. The Annual of the British School of Archaeology at Athens, Supplementary Volume 16. London. Христов, M. 2005. “Могилен некропол от РБЕ край Дъбене, Карловско (предварително съобщение).” Аrheologia (Sofia) 2005, 1–4:127–137. Kalicz, N. 1968. Die frühbronzezeit in Nordostungarn. Budapest. Kalicz, N. 1984. “Die Hatvan Kultur.” In Kulturen der Frühbronzezeit das Karpatenbeckens und Nordbalkans, edited by N. Tasić, 191–218. Beograd. Калчев, П. 1994. “Ранотракийски могилни гробове край с. Овчарци, Старозагорско.” In Първи международен симпозиум „Севтополис”. Надгробните могили в Югоизточна Европа, 131–138. Veliko Tarnovo. Kalčev, P. 2002. “Das frühbronzezeitliche Gräberfeld von Stara Zagora “Bereketska Mogila” (Bulgarien).” SASTUMA 8:5–130. Karageorghis, V. 1960. “Fouilles de Kition 1959.” BCH 84:504–588. Kovács, T. 1982. “Neuere bronzezeitliche Goldfunde in Ungarn.” Thracia Praehistorica. Suplementum Pulpudeva 3, 320–328. Sofia. Kovács, T. 1984. “Die Füzesabony Kultur.” In Kulturen der Frühbronzezeit des Karpatenbeckens und Nordbalkans, edited by N. Tasić, 235–256. Beograd. Kowiańska-Piaszykowa, M., and S. Kurnatowski 1953. “Kurhan kultury unietyckiey w Łękah Małych pow. Kościan. Fontes Archaeologici Posnanienses 4:43–76. Leštakov, K. 1993. “Die mittelbronzezeitliche Besiedlung von Gălăbovo in Südostbulgarien.” SASTUMA 2:191–222. Leshtakov, K. 1996. “Trade centres from Early Bronze Age III and Middle Bronze Age in Upper Thrace.” In Early Bronze Age Settlement Patterns in the Balkans, edited by L. Nikolova. Reports of Prehistoric Research Projects 1, 2–4:239–287. Sofia. Leshtakov, K. 2002. “Galabovo pottery and a new synchronization for the Bronze Age in upper Thrace with Anatolia.” Anatolica 28:171–211. Leshtakov, K., T. Kancheva-Russeva, and S. Stoyanov 2001. “Prehistoric Studies. Settlement Sites.” In Maritsa – Iztok. Archaeological Research 5, 15–68. Radnevo. Morintz, S. 1978. Contribuţii arheologice la istoria tracilor timpurii. Bucureşti. Müller-Karpe, H. 1980. Handbuch der Vorgeschichte. Band IV, Bronzezeit. Dritter Teilband, Tafeln. München. Nikitović, L. 2003. “Krstac – Ivkovo brdo, nekropola sa humkama iz bronzanog doba.” In Sahranjivanje u bronzano i gvozdeno doba, edited by R. Vasić, 11–21. Čačak. Никитовиħ, Л., and Р. Васиħ 2002. “Хумка из бронзаног доба на локалитету Равнине у селу Jанчиħу код Чачка.” Зборник Радова Народног Музеjа, Чачак 32:23–36. Никитовиħ, Л., М.Стоиħ, and Р. Васиħ 2002. Моjсиње. Некропола под хумкама из бронзаног и гвозденог доба. Čačak. Neugebauer, J.W. 1994. Bronzezeit in Ostöstereich. Wien – St. Pölten. Pásztor, E. 1997. “Frühbronzezeitliches Urnefeld in der Flur von Kisapostag.” Alba Regia 26:13–59. Панайотов, И., and С. Александров 2005. “Спасителни археологически проучвания на надгробна могила в землището на с. Овчарци, о-на Раднево.” Археологически открития и разкопки (Archaeological Finds And Excavations) през 2004, 79–80. Sofia. Панайотов, И., К. Лещаков, С. Александров, И. Змейкова, Ц. Попова, and Т. Стефанова 1991. “Селищна могила Гълъбово – къснохалколитна, ранна и средна бронзова епоха.” In Марица-Изток. Археологически проучвания І, 139–204. Sofia. Zaharia, E. 1959. “Die Lockenringe von Sarata-Monteoru und ihre typologischen und chronologischen Beziehungen.” Dacia N.S. 3:103–134. 1 Participants in the excavations included PhD candidates T. Hristova and P. Devlova and undergraduate students B. Gyauruva, S. Shatov and D. Shatova. The scientific consultant was H. Buyukliev, to whom we would like to express our sincere thanks. Alexandrov, S "Golden jewellery from a 2nd millennium BC tumulus grave at Ovchartsi, Radnevo district." 4 May. 2009. In: Horejs, B. - Pavúk, P. (eds. ): Aegean and Balkan Prehistory. http://www.aegeobalkanprehistory.net/index.php?p=article&id_art=15 (23 Apr. 2019).